Lords of Waterdeep is a game of intrigue, shifting resources, and secretive schemes in the most fantastic metropolis of the Forgotten Realms. The powerful lords of the city contend for control of Waterdeep, the City of Splendors. Behind the gleaming facade of tall buildings and winding streets, dark intrigues and shady back-alley dealings play out, leaving the city's treasures and resources ripe for plunder. In this fast-paced game of constantly changing fortunes, you take on the role of a Lord of Waterdeep. Through your Agents, you recruit Adventurers and send them on Quests designed to win favor and spread your influence throughout the city. Expand your treasury, purchase Buildings, assign Agents - choose your actions wisely and you can become the supreme Lord of Waterdeep! this game is a hybrid among amerigame and eurogame, you go as coach of heroes of D&D Forgotten Realms´s City Waterdeep recruiting wizards, rogue, clerics, fighters to fulfill different quest for scoring points. This game components are over the top with cubes, very durable cards and a nice tableboard, also a fit boardgame trail that ensures order and help in game. its a game light enough to be played among an hour or two, holding 2 to 5 players that escalates well on the quantity of players. This game could be a good entry to the modern boardgames world to new games that want a more complex gaming experience without mutch complication. The D&D Theme is on the air, and gives enough flavor for an eurogame. Don't let the title fool you, Lords of Waterdeep is steeped with the lore, history, and quirks of D&D but this hardly prevents the game from being accessible to the layman. A game I personally wanted for a long time and now having it in my collection at these prices is fantastic! Instantly one of my favorite games. Love the worker placement themed with Waterdeep of the Wizards of the Coast, Dungeons and Dragons world. Hits the table all the time and is in my top 10. No need to go into specifics about gameplay, but if you like the theme of D&D and the town of Waterdeep coupled with worker placement. May be my favorite game. It is not the most innovative game but it uses familiar mechanics and a beloved theme to create a solid game. It is not light enough to be an introduction into gaming but works with a wide variety of audiences. I enjoy trying to build and execute my strategy but needing to adjust to what is available. It is an excellent example of worker placement. Get ready to plot against your friends! Great game of plotting and scheming against your friends! Grab your quests, hire wizards, fighters, clerics and rogues, build up the grand city of Waterdeep, block your rival lords and foil their plans by giving them those infernal manditory quest cards (I really hate those). My friends and I have played this game countless times and it almost always becomes everyone on me, as they fear my power BWAHAHAHAHA! Great game, fun and cutthroat! I don't buy games since I have friends who have a closet, sometimes a room filled games. This one I have to have because I just love it! I love that I have a secret objective (Lords of Waterdeep card) that you fill by the end of game to get points that might help you win the game. I love that there's limited amount of spaces, so there's blocking and make you do something else. I love the Intrigue cards for its Mandatory Quest and other cards benefits one, some, and all but still benefiting the one playing the card more. It's a great game to introduce beginners who want to try some light/medium level strategic worker placement games. I also brought the expansion which add a bit more to make it slightly more complex. The game is solid as can be. There is no wonky situations of rule conflicts, no fiddliness that leads to unanswered questions. The gameplay is simple and tight. The goal is easy enough: score the most victory points possible. By completing quests, securing the right buildings, maximizing your lord's potential and cutting down your opponents options via mandatory quests, the victory is sure to be yours. Be careful as other lords scheme against you while smiling to your face. It's time to rule Waterdeep! 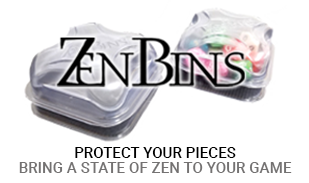 This game is accessible for all skill levels and does reward players for game familiarity. The ease of play will entice new players of designer games while the variability of buildings and quests will satisfy established players. There is much criticism of the theme being pasted on and whatnot, but I find that to be true of many games. If you refer to the orange cubes as orange cubes and not fighters, it is easy to let the theme slip by. But when you see the quest to resurrect a mage guild requires 3 priests and a few fighters and rewards you with mages, you start to see how the theme works for this game. 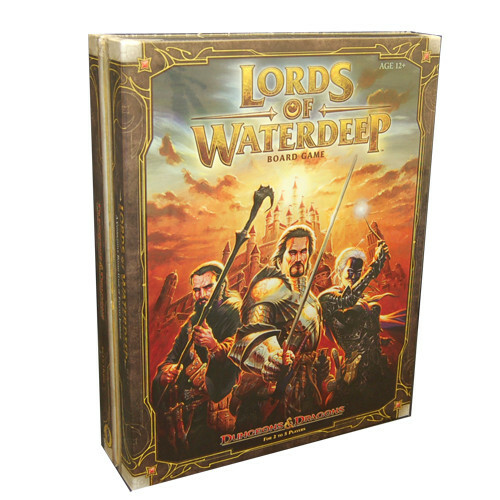 If your gaming group doesn't have Lords of Waterdeep, get a copy today. It is a truly enjoyable title that has hit our table for years and still has many plays ahead in it's future. Lets get the negative out of the way first. I find this game to have ZERO in the way of theme. You could literally take any pictures and glue them to the board and have the same experience. With that being said though this is an easy way to teach new gamers worker placement style games (or Eurogames). Every game changes with a neat mechanic that brings in buildings over the rounds and makes older buildings worth more. If you are picking this up or are thinking of picking this up, I would recommend adding on the Scoundrels of Skullport expansion. however if you have NEVER played this before start with this to be sure its something you can tolerate. Awesome game! If you are thinking about getting this, then just get it. It has good replay value and it is ridiculously addictive. A pleasant surprise of a game. I expected to not like this game very much, but was pleasantly surprised. The game is very disconnected from the theme. I actually think the game would have done better not being themed in the D&D world. It feels nothing like playing D&D or any other roleplaying/fantasy game. It could have been a much more generic theme and probably done better overall. Looking forward to the expansion to see what that brings to the game. Dungeons and Dragons goes Euro! So D&D board games have caught a lot of flak in the past. Some for good reasons, some not. All-in-all I can honestly say, hands down, that this game is my go-to game for worker placement and fantasy mixed in to one. When you play this game you genuinely feel as if you're running parts of a city and working to cut off your competitors. It meshes worker placement with Dungeons and Dragons in a most pleasant way. It's #1 on my top 10 and has been for a long time. Worth the buy, so much replay value! Though this game really feels light on the theme, I'm okay with that. I don't really delve to much into the D&D universe so I'm glad there isn't other things I need to be familiar with in this game. Simple, easy to learn, light on your feet game of pushing cubes! I can't get enough of it and I'm eager to get it on the table right now! Gotta scratch that itch! If you're familiar with the Dungeons and Dragons universe, Waterdeep Harbor is probably familiar to you. We weren't, and so it wasn't. If you're expecting a DnD-type experience from this game, you're likely to be disappointed. We weren't, and so it wasn't. The DnD theme is very light - many people say it's pasted on. If you take the time to remember the official names of the different pieces, and role play actually sending out warriors, rogues, wizards and clerics to go on the various adventures you're funding, you'll find some theme. If you just call them orange, white, black and purple cubes, it's pretty dry. In Lords of Waterdeep, each player takes on the persona of one of a group of nobles who are competing to become the Lord of Waterdeep. Players gather money and adventurers, then send them out on various quests to earn more money and victory points. There is no direct combat in the game. If you have enough of each color cube, you complete the quest. The player interaction is fairly limited. There is one area you can place a worker that allows you to play cards that may affect the other players. Some of these give you an advantage, others give you and another player of your choice an advantage, and still others hinder one or more of your opponents. The only other player interaction is the one that's common to many worker placement games. You can't place a worker into a space already occupied by another worker. The components are very nice. 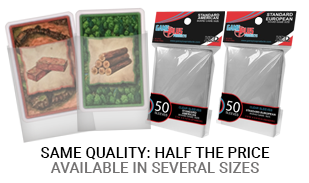 Wooden meeples and resource cubes, thick, beautiful cardboard coins, good quality cards - all the components are great. The box insert is one of the best I've ever seen. There is a spot for everything, and everything pretty much fits into its spot. There isn't quite enough room for all the coins, but that's the only shortcoming to the insert, and that's a very small one. If you're looking for an introduction to worker placement, this is one of the best entry-level wp games I've played. It gets a pretty good amount of play at our house. I have played this game more times than any other I can think of. It is successful with all types of players and with anywhere from 2-6 players (with expansion). The D&D theme may be attractive to some and a turnoff to others, but that doesn't matter because once you play the game you see that the theme is pasted one. It took my wife playing 3-4 times before she understood that the little cubes were meant to represent people. I have since blinged it out with little meeples and metal coins which helps bring out the theme. Highly recommend the expansion too. A great game for people trying to get into euros or anyone interested in the setting. Games usually last around 1 - 2 hours and there is a lot of variety when it comes to the buildings, quests, and intrigue cards. You can play this game several times and still run into something new. The price might be a little high for the components you're getting but for $40 its a steal. A fantastic entry level Euro type game from the D&D universe. Easy to teach, easy to learn, easy to play, with enough strategy and variability to keep you coming back and playing again and again.